If you want to find a book about Oracle APEX for developing real-world application. 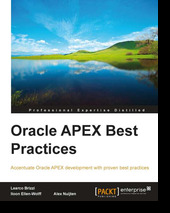 I believe a book titles Oracle APEX Best Practices by Alex Nuijten, Iloon Ellen-Wolff, Learco Brizzi, that will give you much more idea. You will learn to take advantage of advanced SQL and PL/SQL as well. A book was written from Experts' experience, that's useful in a book. When readers read each chapter, they can follow step by step for each example. However, the number of pages in a book has less than 300. You can read Sample Chapters and check Table of Contents.